The Daughters for Life Foundation is now accepting applications for its 2017 Scholarships Program! Take your chance, apply today! At Daughters for Life Foundation (DFL), we’re looking for outstanding female students, who would like to take their education to the next level. We are offering up to 10 scholarships for the next academic year for students to follow their dreams at universities in North America, South Asia, and the UK. We believe that a lasting peace can be achieved in the Middle East if more voices are heard – especially women’s voices. We want to help create the next generation of women leaders. The foundation’s goal is to represent the interests of young women of all nationalities, ethnicities, and religious affiliations across the Middle East. The foundation provides a chance for these young, talented women to study – a chance that might otherwise not be accessible to them. So far, more than 30 young scholars have enrolled in universities and colleges across North America, the United Kingdom, and Bangladesh. They will soon become doctors, sociologists, politicians, and entrepreneurs. One of our scholars Loureen Sayej is a recent graduate of the New College of Florida, and she has already started making a difference in this world. She works as a Lead Program Officer with the Institute for Multi-Track Diplomacy (IMTD) at its Children’s Peace Initiative – Kenya (CPI-Kenya) program. Her main focus is children’s rights and she is formulating the work of CPI-Kenya within an international legal framework regarding the rights of the child. Loureen is Palestinian and her experience growing up in a conflict zone, along with her academic expertise, enables her to be effective in her role with CPI-Kenya. This year, as many as 10 talented young women from Middle East countries will join the Daughters for Life Foundation’s family. They will be selected from among this year’s applicants by our highly qualified jury. We are seeking women who are exceptional academics and high achievers, who demonstrate a clear dedication to their local and global communities; young women who are committed to giving back to their communities in the Middle East region after they complete their studies. We’re looking for young women students who have managed to achieve excellent academic results despite going through financial hardship or adversity; students who can demonstrate how they are working hard to improving the lives of girls and young women through extra-curricular activities, work or volunteer experiences. Our goal is to invest in their potential for leadership and to foster their success in whatever fields they choose to pursue. 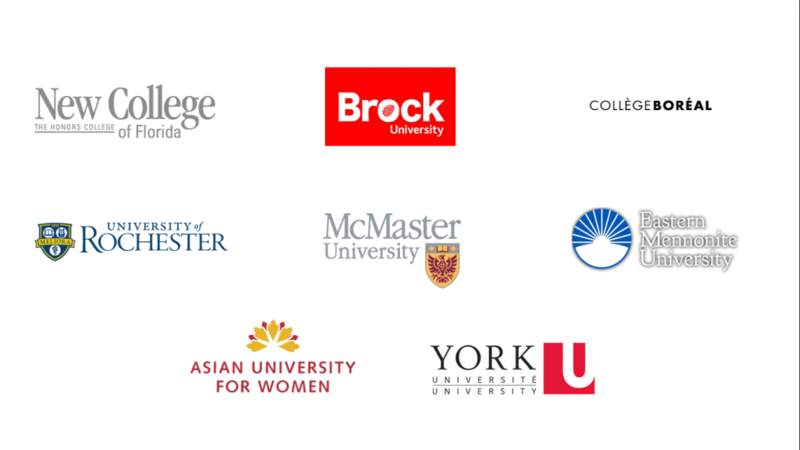 For the 2017/2018 academic year, the Daughters for Life Foundation is grateful to our three new partners in Ontario, Canada: Brock University in St. Catharines, McMaster University in Hamilton and York University in Toronto. We are confident our partnerships will be successful and full of rewarding opportunities for our scholars. Our work at the foundation wouldn’t be possible without our trusted partners, who believe in the power of educated women across the world. New College of Florida, which has been welcoming DFL scholars for three years and has been highly active in the Foundation’s development, is hosting eight scholars this year. Additionally, College Boreal, The University of Rochester, Eastern Mennonite University, and the Asian University for Women will be welcoming DFL scholars for the second time in the 2017/2018 school year. http://daughtersforlife.com/apply/ or email us at apply@daughtersforlife.com.